Through the commitment with the required services, we have been able to establish a strong link with a great number of customers that rely on our services and again and again, thus justifying our presence. Just as we demand of ourselves to fulfill, we also require our suppliers to the highest standards of individual and corporate ethics, which is the first fundamental step towards a stable and responsible relationship. We run all our internal processes according to the regulation protocols established by convention in the world, which defines a large number of structural details to decrease the margin of error and facilitate proper implementation of the structures. Ferma provides different solutions for different industries, carrying out metal projects for 55 years. We have a customer base in all industrial sectors and we have solved needs of all kinds, increasingly specific and sophisticated. We are fully integrated as an engineering, design, construction and assembly company. We have all the technological tools and materials, to be self-sufficient in all phases of any project. 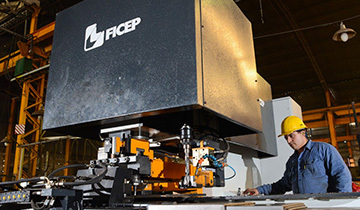 From 14 stations of SDS/2 for the detailing of buildings- unique in Argentina - to an extensive CNC - Peddinghaus Ficep - machines equipment that allows us to face any project, regardless of it complexity. Today, definitely yes. We are extremely flexible and agile, so we can respond quickly to the market requirements. Currently we apply nearly 65% of our production to the mining sector. The know-how gained in the implementation of specific software, allows us to sustain productivity and stabilize the quality of the results as of the times, with a synchronization of simultaneous work in perfect plant. 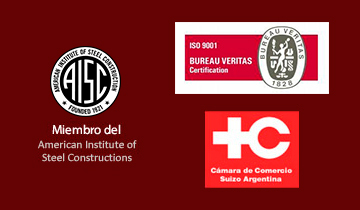 We certify ISO 9001 2015 by Bureau Veritas for Argentina. We have also developed a team of internal quality control which ensures the generation of metal structures minimizing nonconformities in field. Inside the plant there are about 140 people working, probably more than 300 between the erectors and outsourced. The profile is in each position the best, from the smallest to the most complex task trying to professionalize. This means awareness that our customers want the best. And we are here for them. The skilled labor goes where it is well considered and where it can see their labor wishes realized. Permanently we encourage all our employees to improve. We do not have major problems due to lack of manpower.